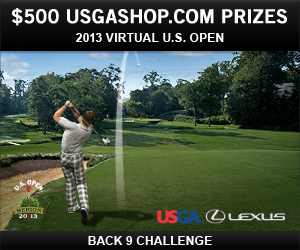 Don't miss the free Virtual U.S. Open Back 9 Challenge on World Golf Tour, with a chance to win $500 USGAshop.com prizes. Two players will each get $500 gift cards to USGAshop.com -- one to the player with the top leaderboard score, and the other to a lucky sweepstakes winner chosen at random. Open to WGT players in all countries. The full Virtual U.S. Open 18-hole stroke play course on Merion will be available in May, all leading up to the real event run by the USGA at Merion in June – the fifth U.S. Open at Merion. Fine tune your swing power with the new WGT Shot Pal, available now on World Golf Tour. Similar to what the WGT Putter Pal does for putts, the WGT Shot Pal displays a ruler below your swing meter so you can better measure the power on your shots. It's especially helpful on approach shots! Shot Pal is available for 20, 200, 1,000 or 2,000 shots, starting at only 10 WGT Credits, and does not work with Putters or WGT EZ Swing clubs. *Note: unlike Putter Pal, Shot Pal doesn't show the exact percent markings on the swing meter ruler, because shot distance isn't as directly related to shot power, like putting distance is related to putting power. This is due to shots involving club type, swing type, lie, wind and other factors. Harbour Town is one of America's top ranked and iconic golf courses. 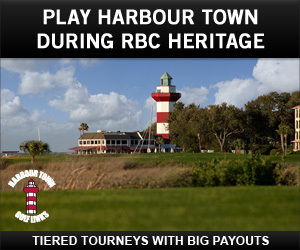 The Harbour Town Golf Links golf course is the host of the PGA Tour's annual RBC Heritage golf tournament and is available as a free closest-to-the-hole online game on World Golf Tour. Hole 18 is the signature hole of Harbour Town, featuring the famous red and white lighthouse in the background. It's typically one of the toughest holes at Harbour Town for PGA players, because of the challenging drive and approach shot. PGA pro Davis Love III has won the Heritage a record five times with the last in 2003. You can try the same approach shot the pros face, free on World Golf Tour in this month's Harbour Town Tiered tournament. In this special tournament, you're competing against players in your same WGT tier, giving you a better chance of earning WGT Credits. WGT Hole 18 Tip - Favor the right side of the green to avoid shots landing short or left and getting wet. Play the same course the pros are playing, Harbour Town, site of this week's RBC Heritage event. In this special golf tournament you will only compete against players in your same WGT tier, giving you better chances to earn more WGT Credits. Harbour Town Golf Links on Hilton Head is a challenging layout, and home of the iconic closing hole with the famous Harbour Town lighthouse. *This special tournament is open to WGT players in all countries, and runs now thru 4/30/13. Harbour Town is one of America's top ranked and iconic golf courses. The Harbour Town Golf Links golf course is the host of the PGA Tour's annual RBC Heritage golf tournament and is also available as a free closest-to-the-hole online game on World Golf Tour. Hole 17 is a challenging par 3 hole at Harbour Town. The long 191-yard approach shot is to a green surrounded by water and bunkers, so you need to make your shot accurate or you'll end up in the lagoon. You can try the same tee shot on World Golf Tour in this month's Harbour Town Tiered tournament. In this special tournament, you're competing against players in your same WGT tier, giving you a better chance of earning WGT Credits. WGT Hole 17 Tip - Pay attention to the wind speed and direction on your tee shot, as the head and crosswinds can easily carry shots into the water or bunkers. 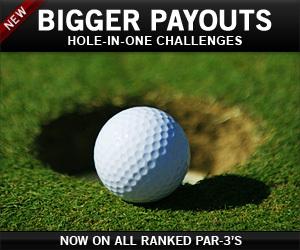 We've added more Hole-In-One Challenges and increased the payouts to give you more ways to earn more WGT Credits. Hole-In-One Challenges are now available on all par-3 holes on World Golf Tour, in both closest-to-the-hole and ranked stroke play. WGT players are winning WGT Credits every day for shooting a hole-in-one, or landing the ball within 1 or 5 feet, and you could be next! The new Hole-In-One Challenges are available on all ranked stroke play and closest-to-the-hole courses on World Golf Tour. You win by shooting a hole-in-one, or landing the ball within 1 or 5 feet of the hole. Choose either 10, 50 or 100 WGT Credits, and you'll see the potential winnings that vary for each hole. Available to players in all countries, except in three U.S. States: Montana, Tennessee, Vermont. 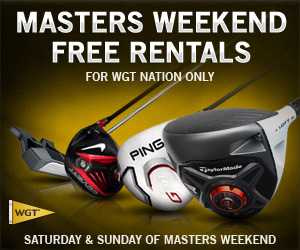 Virtual club rentals are free on World Golf Tour this Saturday and Sunday of Masters Weekend. Try out the latest virtual equipment, all free, while you're watching all the action at Augusta this weekend. Play the new TaylorMade R1 or R11S drivers, the RocketBallz Stage 2 woods, the Nike Covert multi-loft driver, or any of the top virtual clubs that you've had your eye on. *Offer available to WGT players renting virtual clubs from 4/13/13-4/14/13, free 24-hour rental period, and clubs can be re-rented during that time. Just added to World Golf Tour: Merion Golf Club Back 9 Challenge, as part of this year's Virtual U.S. Open. The Back 9 at Merion is now available to play in closest-to-the-hole games on WGT. Get your first look at the back 9 holes, and play for your chance to win $500 USGAshop.com prizes. The full Virtual U.S. Open 18-hole stroke play golf course on Merion will be available in May. It all leads up to the real event run by the USGA at Merion in June, which is the fifth U.S. Open at Merion. *The Back 9 Challenge tournament is free to enter and open to WGT players in all countries, see tournament rules for details and eligibility. WGT players can now enjoy the Back 9 at Merion Golf Club, new all-around TaylorMade Lethal Balls, increased payouts on Hole-in-One Challenges, and much more! Following last month's release of the Front 9 Challenge, we're excited to give you your first look at the Back 9 on Merion Golf Club in a fun, closest-to-the hole challenge. 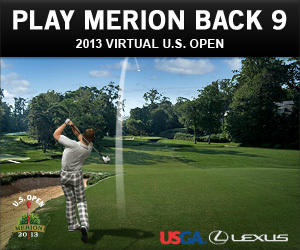 Play the new Merion Back 9 Challenge tournament for your chance at $500 USGAshop.com prizes. And in May, the full 18 holes will be available for stroke play games as part of the 2013 Virtual U.S. Open Qualifier, hosted exclusively on World Golf Tour. Hole-in-One Challenges just got bigger payouts and are also now available on all par-3 holes on World Golf Tour. Based on WGT player feedback, the payouts have been increased for hole-in-ones, as well as landing the ball within 1 or 5 feet of the hole. Look for Hole-In-One Challenges on all ranked stroke play and closest-to-the-hole courses. Get the new WGT Shot Pal to help you improve the power control of your shots. The Shot Pal overlays on the swing meter when you're taking a shot, helping you select the precise power on every shot, similar to the popular WGT Putter Pal. Shot Pal is available with 20 to 2,000 shots, starting at only 10 Credits, and makes a great gift for your WGT friends. 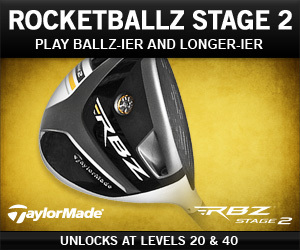 Get the new all-around top-performance ball from TaylorMade. 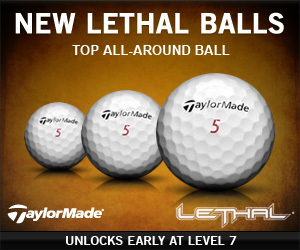 The TaylorMade Lethal virtual golf balls feature a unique balance of extra distance, spin, control and durability -- plus a slower WGT swing meter -- and unlock early at Level 7 for top players new to WGT. 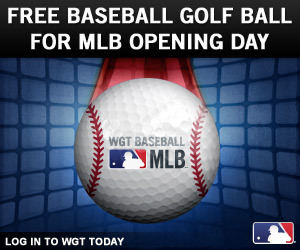 Celebrate the Opening Day of the MLB season with WGT and get one FREE WGT Baseball virtual golf ball just for playing World Golf Tour today 4/1. This virtual golf ball has the official WGT Baseball: MLB logo, a red vapor trail, and red baseball stitching. It makes a great gift for baseball fans too! And join the millions of fans now playing WGT Baseball: MLB, free on Facebook. *Special offer available to all WGT players who log in on 4/1/13, receive one free WGT Baseball: MLB virtual vapor ball.